Jive software just released a December 2010 customer survey of 500 individuals (from CEO to individual contributor), representing more than 300 companies worldwide, a large percentage of whom have more than 10,000 employees, on the business benefits of their 'Social Business' software. 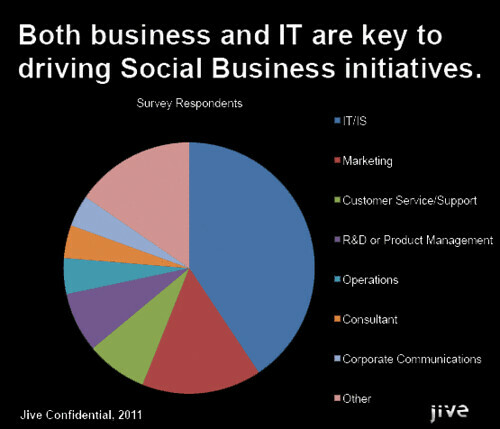 1) Jive customers are deriving quantifiable business benefits from their social business investments 2) 2011 is the year of accelerated enterprise-wide adoption across most industries; and 3) Jive Social Business software is a mission-critical application. Jive attempts to demonstrate that their Social Business Software 'Drives Breakthrough Business Results' in the report, and provides some valuable insight in the areas where they feel these breakthrough benefits are. Demonstrating anticipated return on investment is a key component in the internal process of software purchase, and collaboration and community network technologies tend to stimulate chicken or the egg conversations with Chief Financial Officers to justify their demonstrable value to the business. Jive's report percentages aren't quantified against baselines, but they claim significant increases in efficiency across employees, customers and the greater 'social' worldwide web. • 39 percent increase in employee connectedness; • 32 percent more ideas generated and captured; • 30 percent in employee satisfaction; • 27 percent less email; • 32 percent reduction in time to find answers; and • 37 percent increase in project collaboration and productivity. • 42 percent more communication with customers; • 31 percent increase in customer retention; • 34 percent higher brand awareness; • 28 percent decrease in support call volume; • 34 percent more feedback and ideas from customers; and • 27 percent increase in new customer sales. Jive's findings showed their software requires a tight partnership between IT and Business to be successful. The survey revealed that successful Jive Software implementations are a collaboration between business and IT, where IT is closely involved to ensure that the system has the required scalability, security and corporate governance standards required by the enterprise. Jive are to be commended for revealing the state of their market: they have essentially articulated the broader playing field and demand for collaboration software, community software, social networking and social media monitoring, which are used to engage employees, engage customers - and in some cases attempt to engage both. 10 year old Jive have been the pilot in this space, growing from a forums company, through their Clearspace product period to the the present 'Social Business' messaging and are now making a lot of noise about a possible IPO. In a year when many other vendors are rolling out similar 'me to' collaboration, workstream, community and monitoring add ons to existing enterprise products, this is a timely reminder from pure play Jive about where the heart and business benefits of their market is.